As I head home to New Jersey a few days ahead of schedule, I am reflecting on what I have learned aboard the Thomas Jefferson. From day one, I was asking questions and trying to understand the process of hydrographic surveying, the equipment used and the different roles of everyone involved in the process. 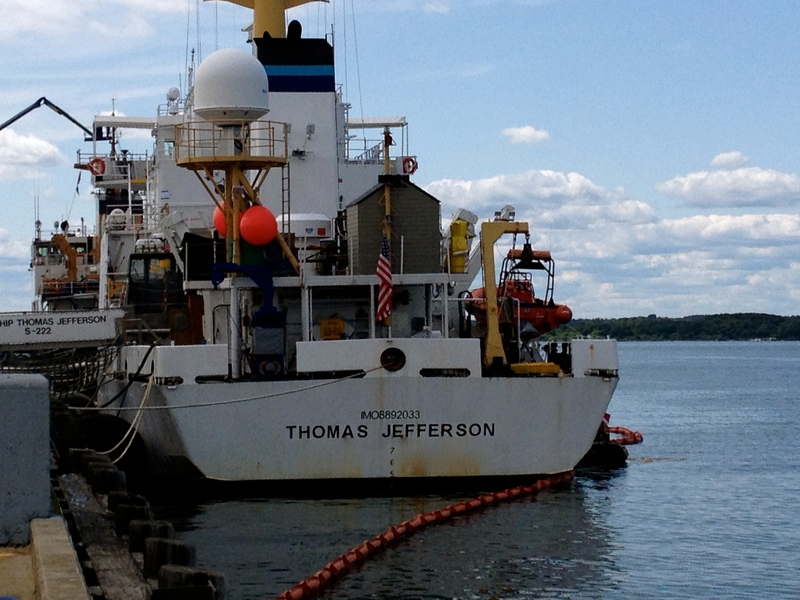 I learned why hydrographic surveying is so important and why the mission of NOAA (Science, Service and Stewardship) is demonstrated in all the research and activities aboard the Thomas Jefferson. The ocean covers 71 percent of the Earth’s surface and contains 97 percent of the planet’s water, yet more than 95 percent of the underwater world remains unexplored. 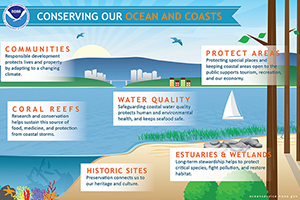 NOAA protects, preserves, manages and enhances the resources found in 3.5 million square miles of coastal and deep ocean waters. The oceans are our home. 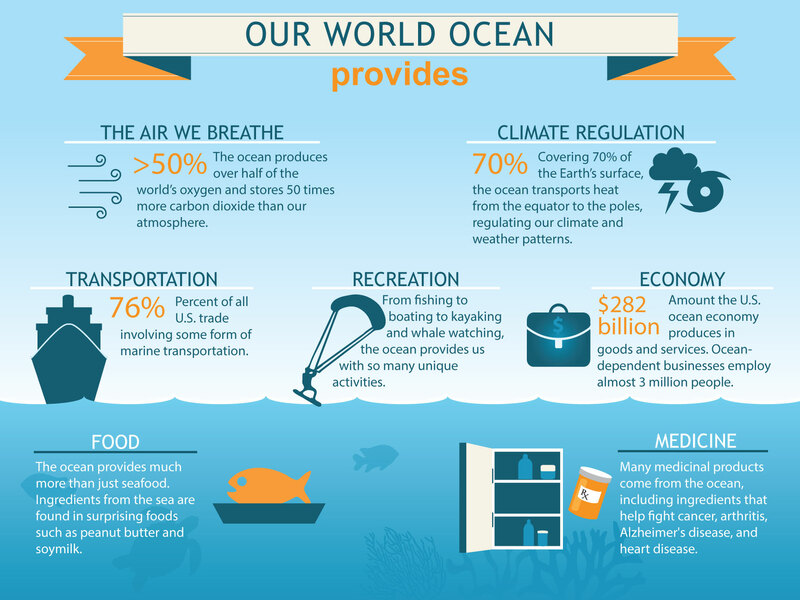 As active citizens, we must all become knowledgeable, involved stewards of our oceans. As my Teacher at Sea experience ends, I wanted to make sure I shared some of the conversations I had with the officers charged with leading the missions of the Thomas Jefferson and the hydrographic work it is involved in. The Thomas Jefferson: Home to an amazing crew! Captain Smith grew up on the water in Maine. He always enjoyed reading maps and charts. He received a Bachelor’s of Science degree in mechanical engineering from Cornell University and earned a Master’s of Science degree from the University of New Hampshire Ocean Engineering (Mapping) Program. He has worked at NOAA in many different capacities. He served aboard NOAA Ship Rainier, NOAA R/V Bay Hydrographer and the Thomas Jefferson. He was also the chief of Coast Survey’s Atlantic Hydrographic Branch in Norfolk, Virginia. Captain Smith also served as Senior Advisor to Dr. Kathryn Sullivan, NOAA Deputy Administrator and as Chief of Coast Survey’s Marine Chart Division. Captain Smith explained how he has been involved in integrating many new technological innovations designed to improve the efficiency of NOAA’s seafloor mapping efforts. It was through Captain Smith’s endeavors that Americans enjoy open access to all NOAA charts and maps. He enjoys being the CO very much and feels the best part of his job is developing the next generation of leadership in NOAA. He feels it is very important to have that influence on junior officers. The worst part of his job is the separation from his family. 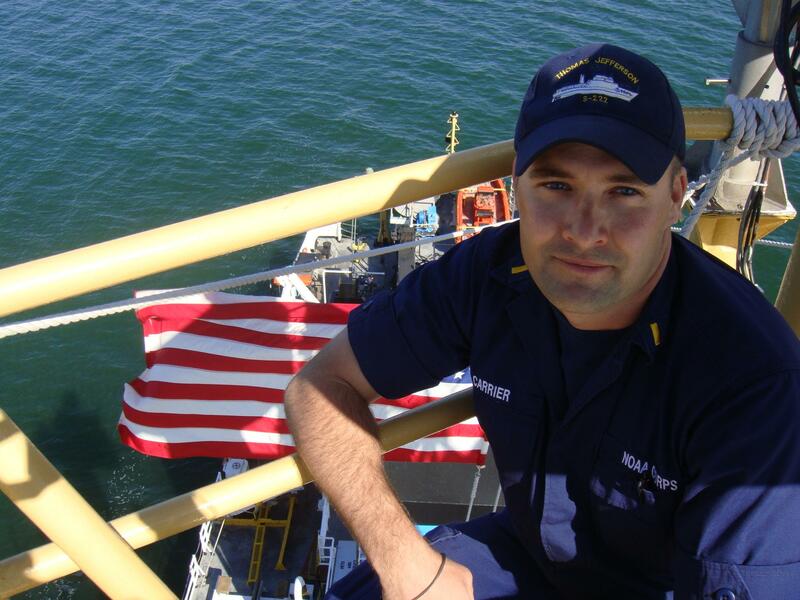 LCDR Hauser grew up in New Jersey and always loved learning about the ocean. As a little girl, she thought she would like to study Marine Science but wasn’t sure how. She grew up and earned her Bachelor’s of Arts in Biology from Franklin and Marshall College and her Master’s of Science in Biological Oceanography from the University of Delaware’s College of Marine Studies. Before coming to NOAA, LCDR Hauser spent time working for a mortgage company, which provided her with different kinds of skills. 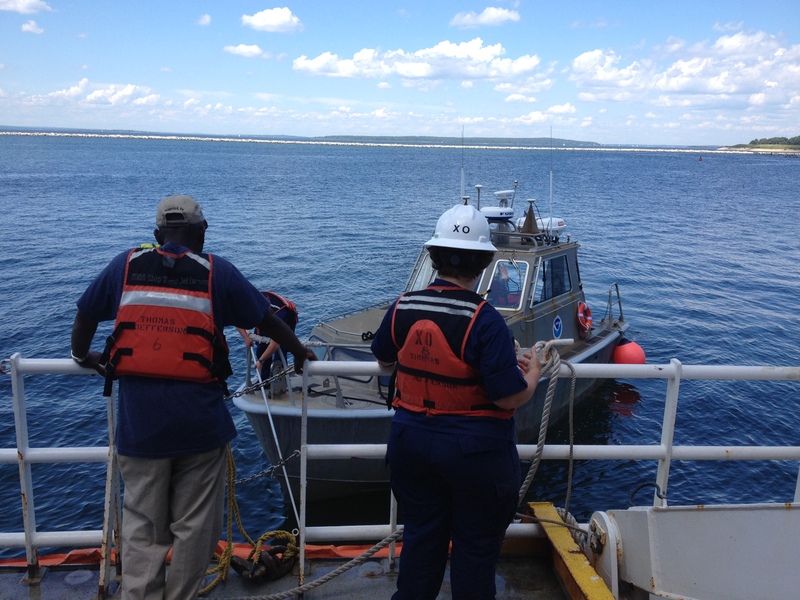 She soon started officer training for NOAA and got to apply the sonar knowledge she developed in graduate school to her NOAA work. She has served on the NOAA ships Rainier and Thomas Jefferson. 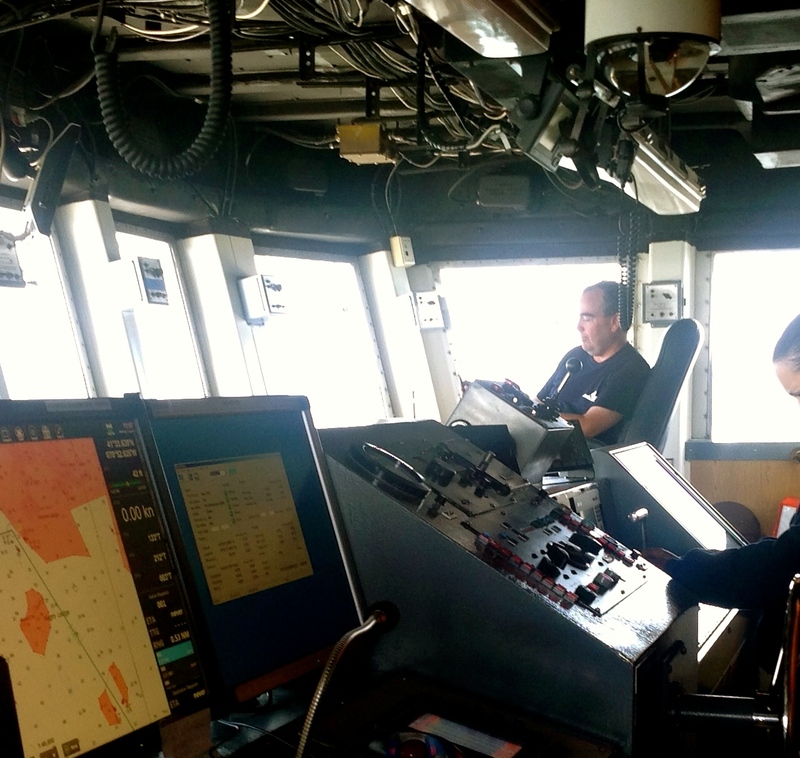 She has built her strong background in hydrography with both land and sea assignments. She has been Field Operations Officer, Field Support Liaison and Executive Officer. She explained that in the field of hydrographic surveying, experience is key to improving skills and she is always trying to learn more and share her knowledge. As XO, she is the second highest-ranking officer on the ship. 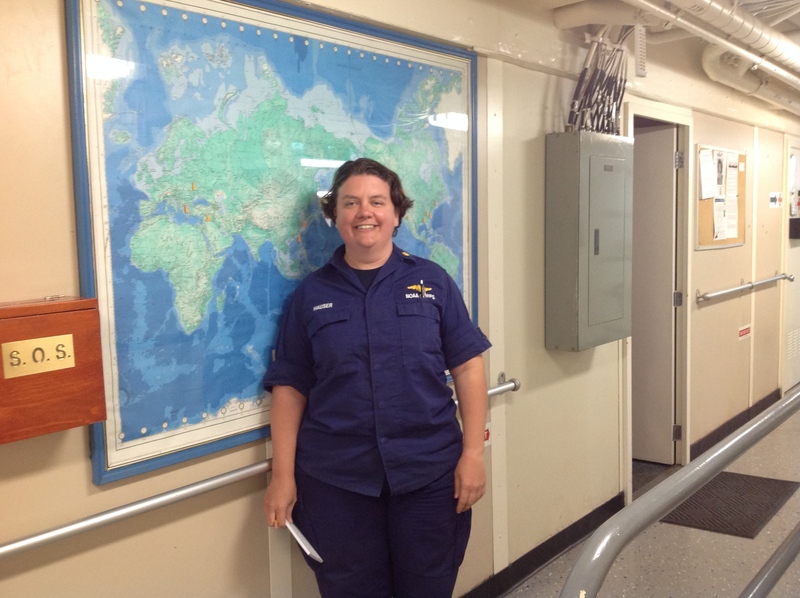 LCDR Hauser feels the best part of her job is that it never gets boring. Everyday is different and there are always new things to see and learn. As a young boy, LT Carrier was the kind of kid who liked to take things apart and put them back together. He joined the Navy right out of high school. When he got out, he attended University of North Carolina at Wilmington and studied biology as an undergraduate and marine science in graduate school. He taught biology, oceanography, and earth science at a community college and worked at NOAA’s Atlantic Hydrographic Branch in Norfolk, VA before attending officer training. 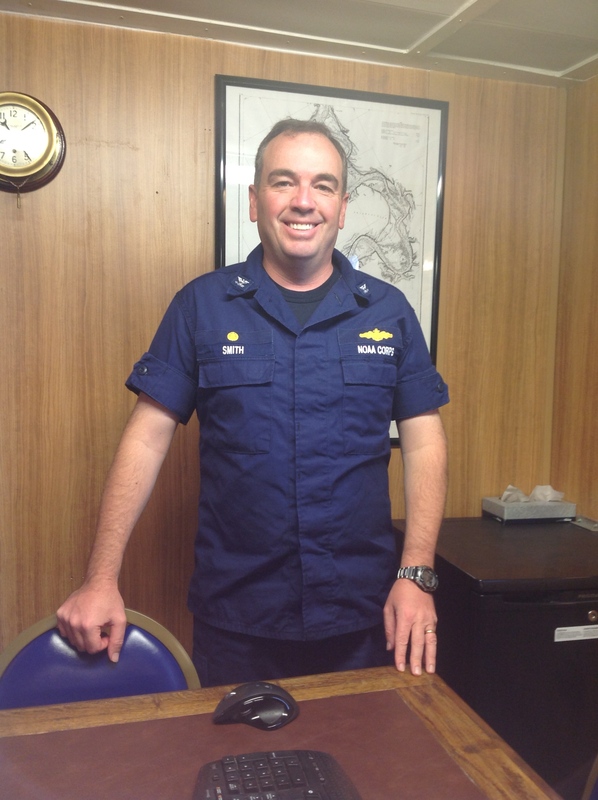 He served on other NOAA ships before coming to the Thomas Jefferson and has learned a lot about the technical aspects of hydrographic surveying, data collection and processing while onboard. He is currently the Field Operations Officer. LT Carrier feels the best part of his job is the great people he works with. He explained that on a ship you are part of a close family that works together, lives together and helps each other. He said the hardest parts of the job are the long hours and missing his family very much. His advice to younger students is don’t get discouraged easily. He explained, “If you are not good at something at first, try again. Know that each time you try something…you have an opportunity to get better at it. Everyone can overcome challenges by working hard and sticking with it! The experience of living and learning on the Thomas Jefferson will stay with me and impact my teaching as I continue to encourage kids to stay curious, ask questions and work hard! 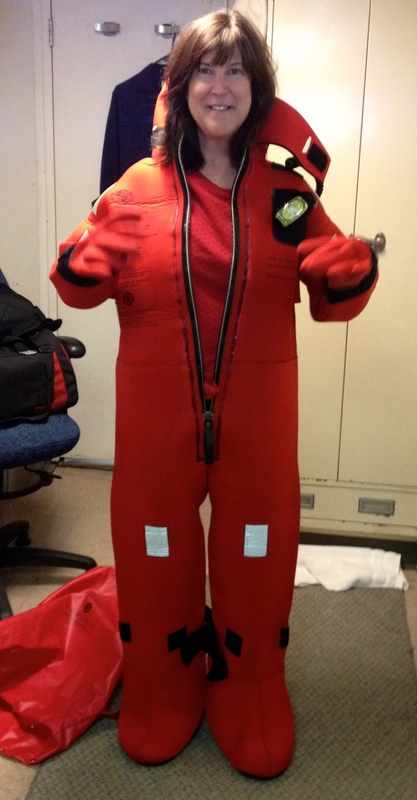 I would like to thank everyone at NOAA’s Teacher at Sea program for enabling me to come on this adventure! My time as a TAS has provided me with authentic learning experiences and a new understanding of science and math in action. I would like to thank every person serving on the Thomas Jefferson who took the time to talk with me and shared his or her area of expertise. I appreciated everyone’s patience, kindness and friendly help as they welcomed me into their home. Every crewmember has given me stories, knowledge and information that I can now share with others. What is this and what do the letters mean? The First SOLAS Treaty was issued in 1914, just two years after the Titanic disaster. The Treaty was put in place so countries all around the world would make ship safety a priority. The SOLAS Treaty ensures that ships have safety standards in construction, in equipment onboard and in their operation. Many countries have turned these international requirements into national laws. The first version of the treaty developed in response to the sinking of the Titanic. It stated the number of lifeboats and other emergency equipment that should be available on every ship, along with safety procedures, such as having drills and continuous radio watch. Newer versions of the SOLAS Treaty have been adopted and the guidelines are always being updated so people at sea remain safe. 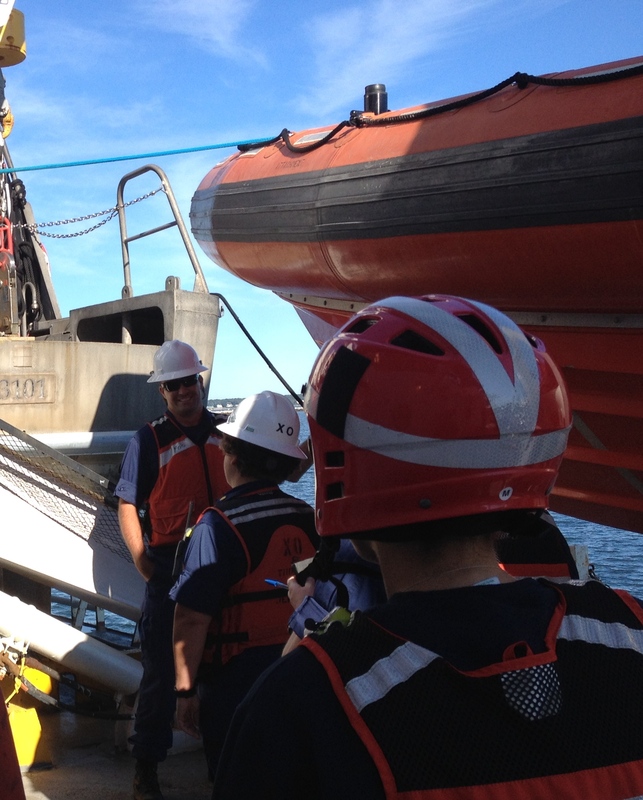 If there was an emergency on the Thomas Jefferson, the crew is prepared because they have practiced many different drills. 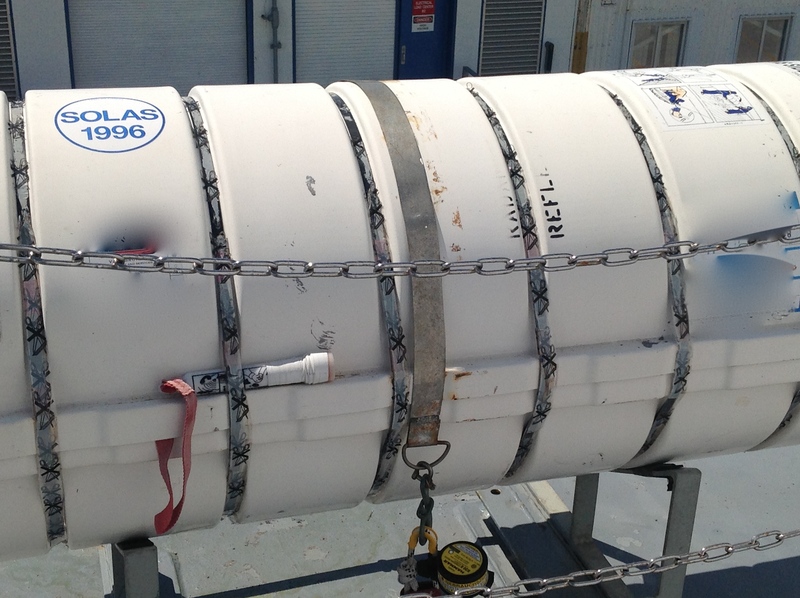 If these lifeboats were needed they would be opened, inflated and used to bring everyone to safety. Many thanks for reading about my Teacher at Sea Adventure! Learning to be safe at sea! This entry was posted in 2015, Jeanne Muzi, NOAA Ocean Service, NOAA Teacher at Sea and tagged Hydrographic survey, Jeanne Muzi, LTPS, multibeam sonar, National Oceanic and Atmospheric Administration, New Jersey, NOAA, NOAA Corps, NOAA Ship Thomas Jefferson, NOAA Teacher at Sea, seafloor mapping. Bookmark the permalink. Jeanne, The information-rich content of each of your blogs (not to mention the photography!) is extremely impressive. It is evident that you learned a ton about something to which most of us have never given a second thought. Your adventure was captured perfectly and enabled us landlubbers to experience and enjoy the whole escapade with you. Welcome home, my friend, and thank you for sharing! Thanks, Pam!! It really was amazing how much I learned! Can’t wait to share with my kids! Jeannie, I so enjoyed your blog entries! Loved seeing you in the “Gumby suit”, too. My favorite entry was when you explained the adjustments made for temperature, salinity, etc., and the math involved. I noted that much of the crew is younger than us. When I was in high school, my first choice was to go to Cornell to study marine biology, but my parents weren’t familiar with the field, which was the domain of Jacques Cousteau and not average folk and discouraged me from it. So, I am very glad to see these people enjoying what they do! So glad you had this opportunity, and that you took the time to keep us informed in such detail. Greatb job, as always! 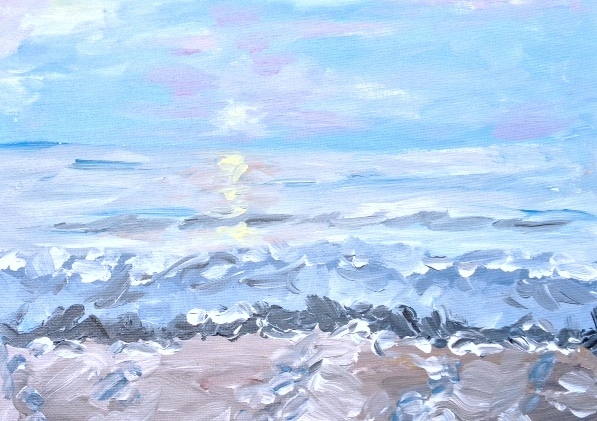 Jeanne, your blog posts were not just informative and beautifully written but intriguing and so thought-provoking. What a teacher/learner/writer/thinker you are! I loved all the inserts–the photos, charts, questions, etc.What’s next? a space mission? Thank you both so much for reading my blog and leaving your kind comments. I really loved sharing everything I was seeing and doing! I think the space mission sounds like a great idea!! What an amazing journey! I’m fascinated by the fact that more than 95% of the underwater world has not been explored…maybe there’s still hope to find Atlantis?!!! You are a true gift to all of us in Lawrence Township.